The three-night stand at Bowery Ballroom by the beloved Memphis band Lucero gave us a prime example of life imitating art. A quick survey of the band’s song titles gives you a clear eye to their themes: drinking, women, loneliness, women, more drinking. For the Bowery Presents gang, three shows by this band on the first three nights of the week has to be an early Christmas, as the fan base has always proven as willing to indulge the band’s favorite vice as the band themselves. What felt like a shift was the degree to which the band made booze the night’s central theme, from the bordering-on-annoying number of references to being (or having recently been) drunk from frontman Ben Nichols, to the beers being slugged by him not just between, but during songs, including a couple to which he forgot the words. Rock n’ roll has never been a teetotaler’s game, and it probably shouldn’t be. But when you’re a band at Lucero’s level — booking the city’s best venue for three nights straight at a tariff of thirty bucks a head — the line between a get-along good time and unprofessionalism grows thin. That glorified bar-band schtick also sells these guys short — Lucero have some great songs, and on the whole, they’re still a heck of an act at performing them. All three of the Bowery shows, of which this was the last, were divided into an acoustic and electric set with no opener. This band is nothing if not giving, with almost three hours split between the hour-long acoustic and nearly two-hour electric set. The band came strong out of the gate with “That Much Further West”, and the acoustic set held together throughout, with the packed house singing along to Nichols’ often-melancholy lyrics (two songs with the word “lonesome” in a row, in fact). As the show went on, things turned a bit more shambolic, as Nichols helped himself to the shots being offered up by the crowd. In spite or maybe because of the whiskey flowing, the band’s electric songs took on a certain wanton urgency, with the signature tune “Nights Like These” earning many a fist-pump from swaying hordes in front. Nichols spelled the band at a few points to do solo or duo numbers, including a memorable “Last Pale Light in the West” from his first solo album by the same name. The final encore, “Here at the Starlite” was yet another tale of woe belied by the rock n’ roll swagger still holding together onstage. It’s a strange dichotomy, the sad songs and the party atmosphere they create. But for Lucero, it seems to still be working. I recorded this set with Schoeps MK41 supercardiod microphones from our usual spot in the venue. The microphones rejected much of the crowd noise, providing for a nice, balanced recording of the night’s proceedings. Enjoy! 18 Hey Darlin’ Do You Gamble? Thanks to Kronosphere for the setlist. If you enjoyed this recording, PLEASE SUPPORT Lucero, visit their website, and buy their records in their online store. The Sheiks are from Memphis, which makes them difficult to google. The “Memphis Sheiks” was one of the alternative names of the Memphis Jug Band, the influential early 20th century African-American roots/bluegrass band that performed for nearly thirty years. The Sheiks was also the name of a regionally successful St. Louis rock band in the 70s and 80s, that played often in Memphis, New Orleans and the Mississippi region. The contemporary band known as The Sheiks is a garage rock band, and a damned good one at that. We caught them at Cake Shop last week and their half-hour set was pretty much everything you want from this genre of music — loud, energetic, fun and a little messy. The Sheiks released Witches + Mystics last Summer and the band performed much of the album, along with a couple of new tracks and one neat cover. We are streaming “Until I Find Her”, the opening track on the album, and a high-speed rave up that represents everything that’s good about this genre and this band in particular. I recorded this set with the Sennheiser cards mounted above the stage and mixed with DPA omni mounted in front of the stacks. The four mic mix is quite excellent, if a bit low in the vocals. Enjoy! 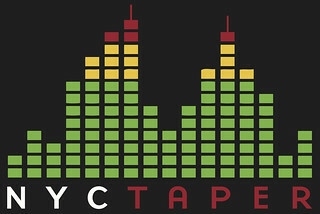 If you download this recording from NYCTaper, we expect that you will PLEASE SUPPORT The Sheiks, visit their Facebook page, and purchase Witches + Mystics from their Bandcamp page [HERE]. There are two main paths that bands take to success these days: There are the bands with instant buzz, who find themselves on the late night TV circuit and playing large venues instantly. (They tend to flame out quickly, too). Then there are the bands who earn it the hard way – playing 200-plus shows a year, gigging every goddamn festival and radio station and bar in every corner of the country, putting thousands of miles on a broke down van and doubly more miles on their livers and sanity, all for the love of music, sure, but also for a shot at success. Success, for a rock band these days, is a bit redefined, but Lucero have achieved it, and they’ve achieved it the hard way. An unabashedly masculine band, whose hardscrabble tales ring with authenticity, Lucero sometimes seems to be of another era. It’s hard to argue otherwise about a band that titles their current release (their eighth record, but first on ATO Records) Women and Work. After all, for the early 21st century American man, work is something he hasn’t got, and women – well, they’re too busy doing all the work. But that’s the beauty of Lucero – they remind you of better days, but they also remind you of the simple pleasures of the days you’re in. The boys themselves always look like they’re having fun. Frontman Ben Nichols’ most frequently-uttered phrase between songs is “hell yeah!”, and the band made quick work of a handle of Jameson onstage. 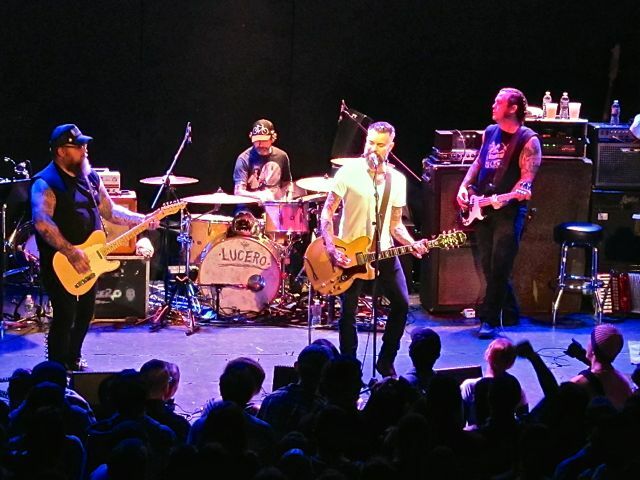 Lucero’s music, even when tackling sadder subjects, has good cheer to go with its honest grit. Today we are presenting two recordings from Webster Hall – the first from October of 2009, the second from April 20 (yes, that date) of this year. These two shows are perhaps more telling in their similarities than in their differences; the band may have continued to expand their sound and personnel, but the core of their music is consistent and strong. Maybe there’s a bit more gravel in Nichols’ pipes, but that doesn’t hurt a thing. And despite spending virtually the entire past decade on the road, they sound as fresh and hungry as ever. For example, with its early curfew, Webster Hall practically demands short sets – but Lucero played a two-hour set of nearly 30 songs. Nobody told these guys about lowering expectations. The songs – well, there are those to talk about too. That word “honest” comes up again, when you think about a Memphis band whose sound pays homage to the country and blues and even R&B that fuel the town, but with a bit of a punk flavor thrown in. At the 4/20 show, the new songs were a blast; it’s hard to argue with the rocker “I Can’t Stand To Leave You” or the honky-tonk “Like Lightning”. A stripped-down group of personnel played “The War”, the World War II tale that could easily resonate with soldiers in Afghanistan and elsewhere today. And of course, Lucero played the favorites that the band is probably expected to play at every show, and why not? “Nights Like These” is one of those songs you never get tired of; same for the valedictory “Last Night In Town”. 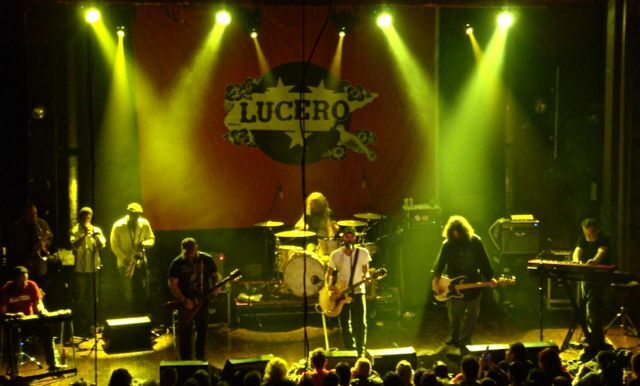 Lucero made quite the impression on me when I first saw them in early 2009. After the release of the excellent ‘1372 Overton Park’ album later that year, they embarked on a tour with fellow Memphis musician Amy LaVere and blues/rock duo Cedric Burnside & Lightnin’ Malcolm. Billed as the “Ramblin’ Roadshow and Memphis Revue”, it was also the first time the group ever toured with a horn section to mirror the sounds on their recent disc. Being on the road with this handpicked crew must’ve had a positive influence as both the band and the particularly boisterous crowd on this Saturday night seemed to have a great time. While drinking and fielding song requests, Lucero played the majority of ‘Overton Park’ and dug out a number of older nuggets that had the party whooping and hollering for more. We can keep spilling words about them, but really, all you need to know about Lucero is contained in their sendoff to us at the 4/20 show: “We appreciate each and every one of y’all making dreams come true. Dreams do come true!” A lot of things about rock music have changed in the fourteen years of Lucero’s career; a lot of dreams have changed, many for the worst. We’re pleased to raise a glass to these guys realizing theirs – they deserve it. I recorded the 4/20 show with Schoeps MK5 cardiod microphones in a wider NOS configuration from directly behind the soundboard in order to give the recording a spacious, open sound. Johnny Fried Chicken boy recorded the October 2009 show with AKG 414 large-diaphragm mics that are always great-sounding, but especially for this band. If this is your first time reading about Lucero, you might check out his recording of the band from Mercury Lounge last year first – it’s an instant classic. Enjoy these recordings, and support Lucero! Thanks to Lucero and their management for their accommodating treatment of us at this show and many others. 08 Hey Darlin’ Do You Gamble? 07 What Else Would You Have Me Be? 16 Hey Darlin’ Do You Gamble?